(CBS/WBBM/AP) PALOS TOWNSHIP, Ill. - Three suburban teenagers have been charged with helping a high school classmate kill his parents in a Chicago suburb last month. 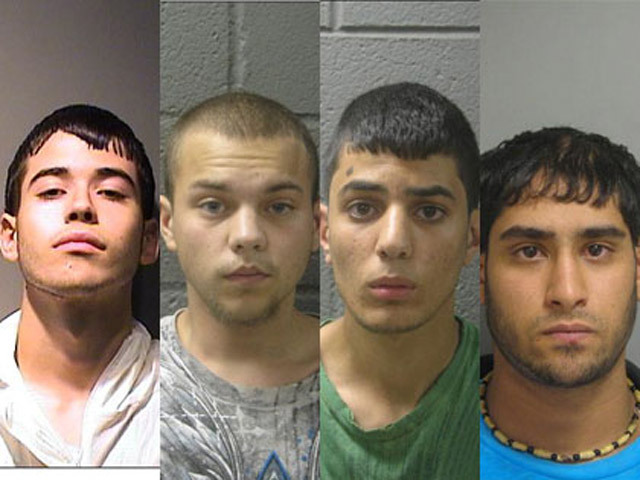 Christopher Wyma, 17, of Bridgeview; Mohammad Salahat, 17, of Chicago Heights; and Ehab Qasem, 19, of Hickory Hills, are each charged with first-degree murder in the slayings of John Granat, 44, and his wife, Maria Granat, 42, reports CBS station WBBM. They were found beaten and stabbed to death Sept. 10 in their home. Their 17-year-old son, also named John Granat, initially called police to report that his parents had been murdered but he was charged with the murders shortly afterward. Wyma and Salahat are both seniors at Amos Alonzo Stagg High School in Palos Hills, where the younger Granat also attended. Qasem is a 2011 graduate of Stagg and a friend of the defendants, according to the Cook County Sheriff's Office. The defendants are charged with carrying out a premeditated plan to rob the Granats of thousands of dollars in cash. The younger Granat told police that he had fallen asleep in the basement of the home around 12:30 a.m. that Sunday and was home the entire night. He claimed he woke up the next day to find the house ransacked, and when he went to wake up his parents for church, they were dead. Maria Granat was stabbed repeatedly while in bed, while John Granat Sr. was beaten to death. He was found lying on the floor at the side of the bed, according to the sheriff's office. But police say the younger Granat's initial story was proven to be untrue. It turned out that he had been pulled over by Palos Heights police for a minor traffic offense at 5:17 a.m. that morning, sheriff's police said. Sheriff's police said several conflicting stories came out of Granat's mouth, until finally, he told investigators that he had needed money and let a friend come into the house while he was out. Granat said he fell asleep in his own car and didn't come in until 7 a.m., when he found his parents dead, according to sheriff's police. But sheriff's police concluded that Granat himself was the killer. They found out from several friends that he had threatened to kill his parents several times before. Granat later said he had been with Wyma, Salahat and Qasem, but they denied his claims when first questioned. But investigators pursued leads even after Granat had been charged, according to the sheriff's office. On Sunday, sheriff's investigators began questioning the new defendants and they finally admitted to the crime. Salahat told detectives he drove Wyma and Qasem to the Granat home and let them in around 2 a.m. The three told investigators they went upstairs with Granat and found his parents asleep in bed, at which point they began beating the victims with baseball bats and Granat began stabbing his mother. After the victims were killed, Granat provided the other three with some of the thousands of dollars in cash his parents had kept in the home, according to the sheriff's office. Then they left and threw away their weapons and clothes in forest preserves and other locations, according to the sheriff's office. A knife, baseball bats, clothing and cash were later recovered. John Granat Jr. is now being held without bond in the psychiatric wing of Cermak Hospital at Cook County Jail. The three other defendants are set for a bond hearing Tuesday at the Bridgeview courthouse and Granat Jr. is also set for a hearing.